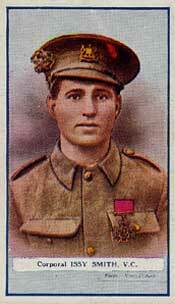 Isaac Smith, an emplyee of J. Lyons & Co who served in the First World War was awarded the Victoria Cross. He was a member of the Chocolate Sales Department at Cadby Hall. Above is a cigarette card issued by Gallaher Ltd in 1915 under the title The Great War V.C. Heroes 3rd Series. On 26 April 1915 at St. Julien, Belgium, Corporal Smith left his company on his own initiative and went forward towards the enemy's position to help a severely wounded man, whom he carried a distance of 250 yards into satety. When casualties were heavy later in the day Corporal Smith again displayed great gallantry in helping to bring in more wounded men and attending them, regardless of personal risk. Issac Smith, who served in the Manchester Regiment, survived the war, returned home and subsequently immigrated to Australia where he died on 11 September 1940. On 7 October 2002 the war memorials of J. Lyons & Co. were rededicated, after having been relocated to Margravine Cemetery, in the London borough of Hammersmith & Fulham. It was exactly 80 years since the company first unveiled its Great War memorial - commemorating 227 employees who lost their lives - and 53 years since dedicating its Second World War memorial - commemorating 242 employees. Both memorials have now been given a permanent resting place, a short distance away from the Company's former head office in Hammersmith Road which they occupied for 100 years. The service of rededication was performed by the Rev. Simon Downham of St Paul's Church, Hammersmith, London, at 11.30 a.m. on Monday, 7 October 2002. Private wreaths were laid for the Parachute Regiment and families. The service was attended by approximately 80 persons, 40 of which were Lyons pensioners, with a large delegation from Hammersmith Council and The Royal British Legion, Greenford Branch. As part of the memorial relocation assignment, and in order to learn more of these patriots, considerable research has been carried out on the names. Many facts, and anomalies, have emerged from this research, which helps bring to life the mere names and initials inscribed on the memorials. It has been found, for example, that one of the founding members of the company, Sir Joseph Lyons, lost his nephew (Captain Edward Christian, MC, 235th Brigade Royal Field Artillery) in the Great War. Surprisingly, his was the only death recorded in the Company's official minute books. Of those killed in the Great War, 218 served in the army, predominantly in London and Artillery regiments and they came from all parts of the United Kingdom. Many died on the battlefields of Ypres, the Somme, Gallipoli and during the German and Allied offensives of 1918. The first casualty was that of Alfred Terry, Rifleman, King's Royal Rifle Corps, who was killed on 14 September 1914, probably at the Battle of the Aisne. 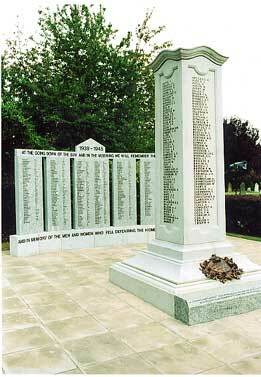 An even greater number of employees were killed in the Second World War, with the memorial listing 242 names. Several more employees are believed to have died but, for reasons unknown, were not included in the roll. The highest-ranking casualty of this war was Major General Harry Willans, CB, CBE, DSO, MC, TD, Royal Corps of Signals. He is reported to have been killed in a flying accident in the Middle East. Lieut. Francis Beaufort, Royal Inniskilling Dragoon Guards, was killed on 27 May 1940, during the retreat to Dunkirk. His father was a Major in the Devon Regiment (and said to be a founding member of the Royal Flying Corps) but his family is best remembered by the grandfather, Rear Admiral Sir Francis Beaufort, who invented the Beaufort Wind Scale. J. Lyons & Company was established as a private company in 1887, when there was a great upsurge in Victorian consumerism, and became a public limited company in 1894. Its head office was at Cadby Hall, Hammersmith Road, London. Apart from the colossal output of bread and cakes from the Cadby Hall factories, Lyons created the Nippy waitress, Corner Houses with live music, concert teas and the quintessential teashop which appeared in many high streets during the early part of the twentieth century. Soon the company was building hotels and luxury restaurants. These, like the British Empire, have passed into history, but their impression on the British psyche endures. By the start of the First World War, Lyons' catering, hotels, bakeries and many associated businesses across the United Kingdom employed 15,000 staff. It had become one of Europe's largest catering and food manufacturing companies. By 1939 employee numbers had grown to 30,000, peaking to nearly 34,000 in 1975, by which time Lyons had become an international, public limited company with worldwide interests. In 1978 it was acquired by Allied Breweries Ltd and the merged interests became Allied-Lyons plc. The Club is intended to serve as a memorial to those noble fellows who at the bidding of their country left our service, went forth to the Great War and laid down their precious lives in the defence of freedom of the World and of our hearths and homes. It was also designed to commemorate the gallant deeds performed by those others of our staff who had happily escaped making the great sacrifice, but who had suffered permanent injury in the discharge of their duties on land and on sea. It was felt that the establishing of the Club was the greatest tribute from the heart, marking the directorsÄô deep sympathy with those who had suffered. I am sure that we are one in the opinion that the greatest homage we can pay to the memory and deeds of those heroes is by our earnest endeavours to make this dear country of ours greater, stronger, happier and more prosperous than before. To reinforce the company's commitment to honour the Sudbury Hill sports grounds, a twelve-foot, four-sided, nine-ton granite obelisk was erected listing all 228 names on the four sides of the obelisk. The unveiling of this war memorial took place on Saturday, 7 October 1922. 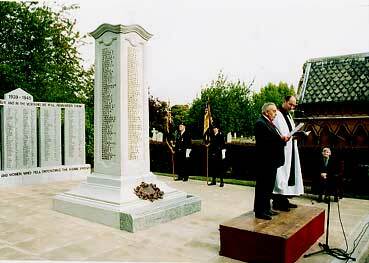 After The Second World War a complimentary memorial was erected to honour the dead of this conflict. 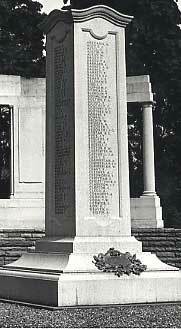 This second war memorial consisted of an arc of Portland stone, placed behind the former memorial, with the names of the 242 dead inscribed on five vertical tablets. Lyons Club members were given the opportunity to subscribe a maximum of 1/- each toward its cost. Around the memorials was a Garden of Remembrance, laid out with lawns and flower-beds. Wooden seats, made by the men of St. Dunstans' were placed in the gardens. Poplar trees were planted behind, and in the spaces between the raised panels were flower troughs where flowers bloomed all year. It was officially opened during a ceremony on Armistice Sunday, 9 November 1947, attended by 1,000 members of staff and families of the war casualties. Laurence Binyon's words 'the going down of the sun and in the morning we will remember them' were inscribed in gold leaf along the top stones of the memorial. In 1968, when Lyons disposed of its interest in the property at Sudbury Hill, the memorials were relocated to a new Garden of Remembrance, within the grounds of the tea factory at Oldfield Lane North, Greenford. By 2000 the majority of the Lyons trading companies had been sold and part of the disposal programme included the 63-acre site at Greenford where the main tea, coffee and confectionery production had been centred. This fascinating history is told in The First Food Empire - A History of J. Lyons & Co., published by Phillimore & Co. Ltd, Chichester. Since 1968, Greenford had been the resting-place of the company's revered war memorials and by 1997 plans were put in place to move the memorials again. After an inauspicious start events moved fast when Hammersmith and Fulham Borough Council gave a favourable reaction to the appeal of placing them in a suitable location within their jurisdiction. Their planners soon identified a suitable resting-place in Hammersmith Cemetery (sometimes known as Margravine Cemetery), close to Barons Court underground station and the former food factories of Cadby Hall. The Council also undertook the responsibility for maintaining the memorials in perpetuity, following a financial settlement with the company. As part of the relocation process, it was considered fitting to document the history of the memorials and to undertake research into the war casualties so that future generations might have a better understanding of how these former employees met their deaths. Preliminary studies of the names had identified a number of ambiguities, which required investigation at the very least. However, one of the major obstacles to research is the lack of any surviving documentation and the fact that only surname and initial(s) are inscribed on the memorials. Some progress has been made but those with wide-spread names are proving difficult to identify. With this in mind an appeal is being made, via the internet, to surviving families or ex Lyons employees who may be able to help in this quest. The names under research, some of which appear to have been misspelled, are as follows but it is known that some employees who were killed are not listed and information is sought on these..
Copeland C. F. G. W.
John Clark, George Dutch, James Fisher, Bernard Isaacs, Vincent Jackson, Robert Jones, John Lahey, Arthur Perrett, Frank Pipe, Arthur Sallis, William Thomas, Neville Wheatley and Stanley Williams.